I like to joke with my clients about my habit of choosing black to wear. 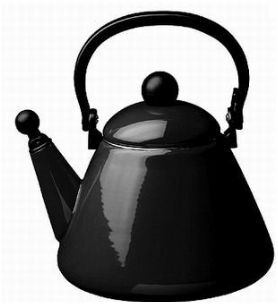 It’s not that I live in Melbourne, where black is a favoured colour at all, but it’s the case of the “pot calling the kettle black!”You see, I’m an expert on stress! Not only do I give presentations on how to identify it and reduce it, but being competitive, I can probably do stress better than most! So how has stress served me? 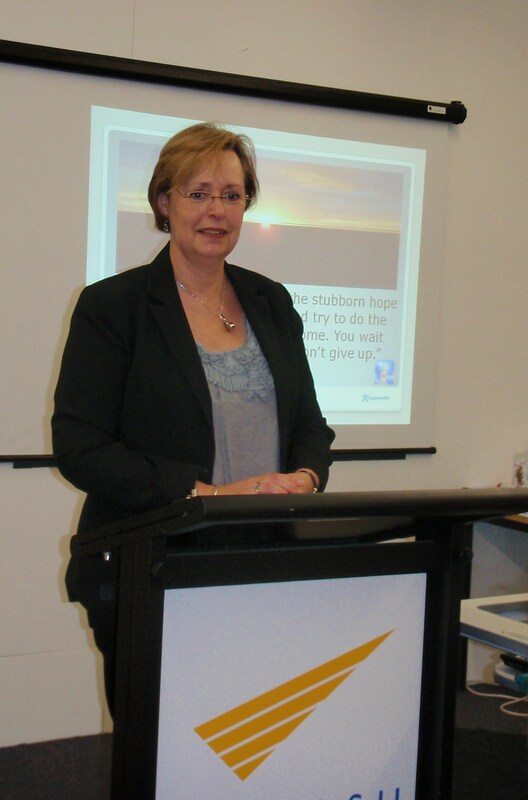 Apart from giving me a topic to talk about; when I removed a major stressor from my life – working in schools – I experienced a post stress, cardiac event earlier this year. Which of course has given me another topic related to stress to talk about! Denial – it’s not happening to me. So much into denial that I put myself into a hypnotic state and waited for the symptoms to go away, which of course they didn’t. Anger – I got angry with everyone; myself, family, the doctors, the nurses….. I was ready to get up off the hospital trolley and go home because NO-ONE was telling me what was happening to me, prior to the angiogram. Bargaining – this was a fairly brief stage, more along the lines of how I might re-organize my lifestyle and having to come to terms with asking people to help, which was a new and difficult experience. Depression – debatable whether I got to this stage. I did experience anxiety as I was continuing to have symptoms and sought professional help to manage this. Unfortunately the psychologist I saw, considered that my symptoms were more mental than physical and I went back into the “angry” stage, contemplating cancelling a scheduled cardiac procedure, which subsequently showed a physical issue. Acceptance – I have now accepted that the events happened and through my own process, have come to the conclusion that I happen to have a condition (insert your own condition here…)that can be treated by…… you guessed it….. Hypnotherapy! William James put forward the theory that 95% of our mind works at the unconscious or sub-conscious level taking care of biological functions as well as so much more of what we do and think. 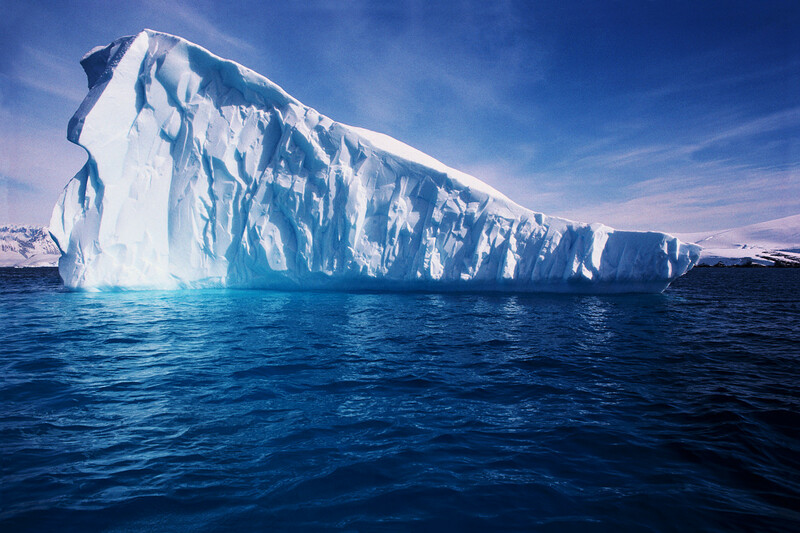 Like an iceberg, only 5% is on the surface. If this is so, then we can harness this unseen energy to change our focus. So if you have just been diagnosed with a health problem, perhaps Type 2 Diabetes or a Cardiovascular issue, are you the person with the disease or do you just have symptoms of the condition? We k now that the potential of the human mind has barely been used and if this is so, then it is possible to de-hypnotise yourself from the suggestion that your future will be the same as the next person’s, without taking into account differing lifestyles. If you are anxious about your health, or have been recently diagnosed with a health condition or experienced a series of cardiac symptoms, then a few sessions of Hypnotherapy combined with some powerful coaching techniques will help. Call to book a half hour complimentary session to discuss how you can use Hypnotherapy to successfully manage your mindset and reduce anxiety. Club secretaries or organizations may be interested in the one hour presentation on 10 Keys to Managing your Health as this is particularly relevant to the Baby Boomer generation. A weekend away was planned many months ago and before my recent surgery. The 6 week checkup was brought forward to 5 weeks to get the “all clear” to go away, but a minor spanner in the works with the cardiologist leaving the practice. The next available appointment with a similar specialist is mid October. Time for a new mindset. I must be OK because the medico’s don’t need to see me. Camper hooked up, we headed off. No trip away in this camper without some rain and we had some light showers whilst driving. A full day driving and the Nissan was not running so well. No oomph at all to climb those hills. Running out of puff….. could have lots of fun with the metaphysics of this. 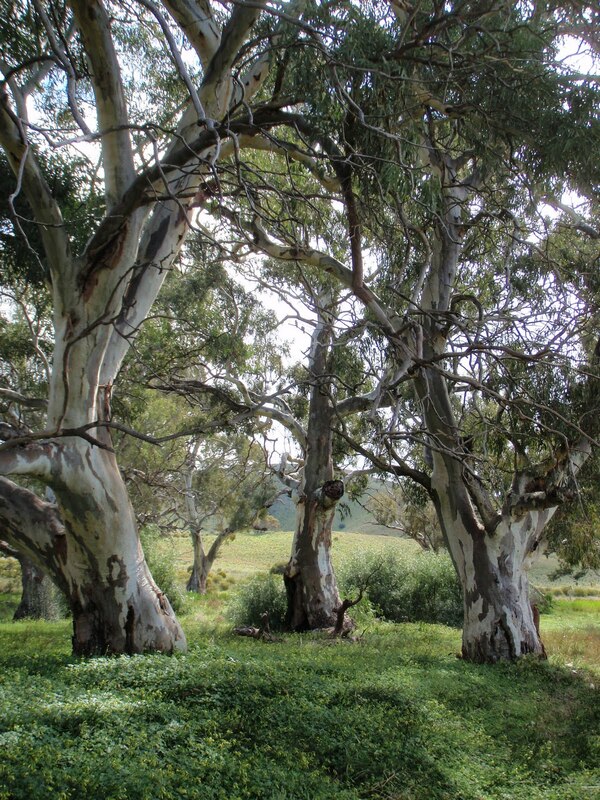 Big lunch at Dadswells Bridge – where the “Big Koala” is and quite different to see the surrounding countryside in varying shades of green and yellows – these being alternately from the wattles and the canola crops. Most of our trips through this area have been earlier in the year and before the drought broke and the flooding took place. 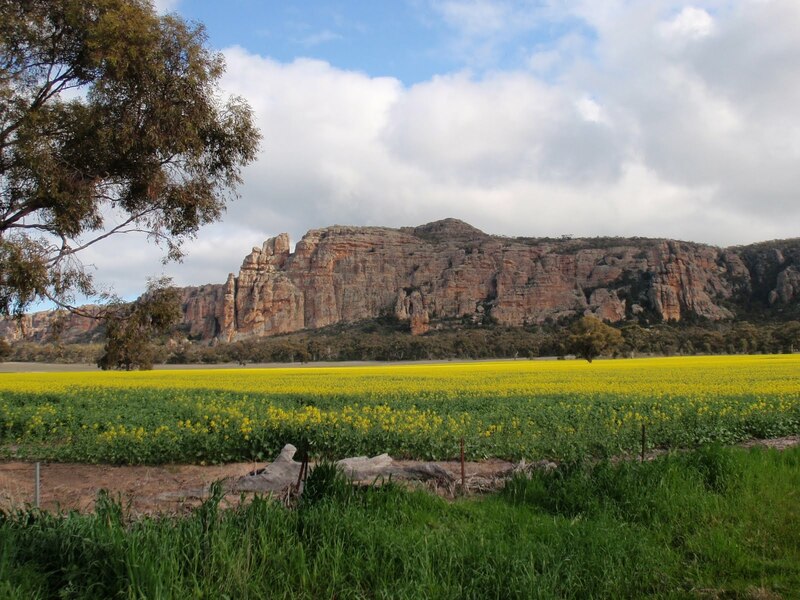 Turning off the main road to take a road less travelled we came across Mt Arapiles – quite spectactular. Mitre Rock nearby was also fascinating and gave us something to focus on as we drove toward it. Junk food for dinner at Murray Bridge and heading out to the campsite in the dark. Obviously the Roo Whistle that we have mounted on the front of the Nissan works well as we didn’t see any bouncing about in the headlights at all! 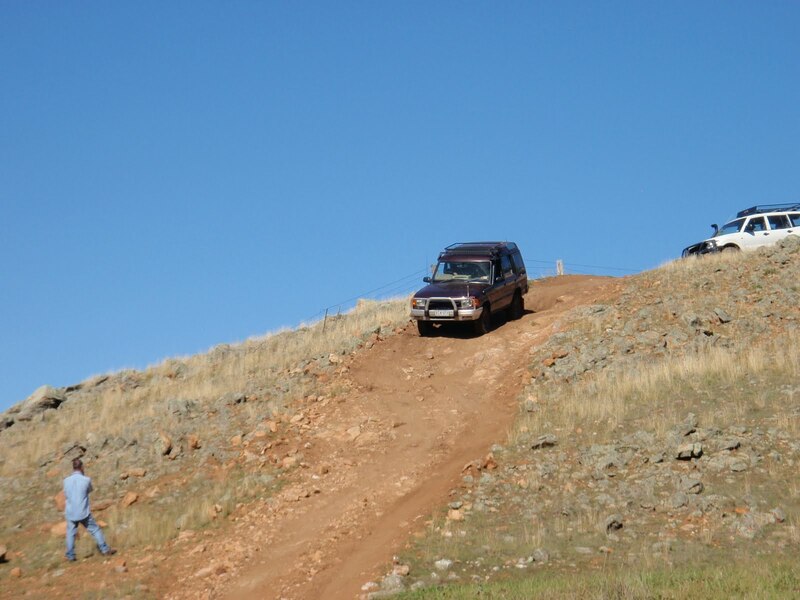 We were welcomed at Saunders Gorge Sanctuary by Rob of Red Earth Expeditions who organized the weekend and the braking classes for people with their new Ultimates or XTracks. They were all cozy around a large campfire and we were directed to a camping site a little down the track where we proceeded to set up in the dark. What a spectacular view in the morning. And the bird song! Started well before dawn, raucous kookaburras and then all types of cockatoos & galahs as well as the quieter, more melodious song of the finches and other smaller birds. 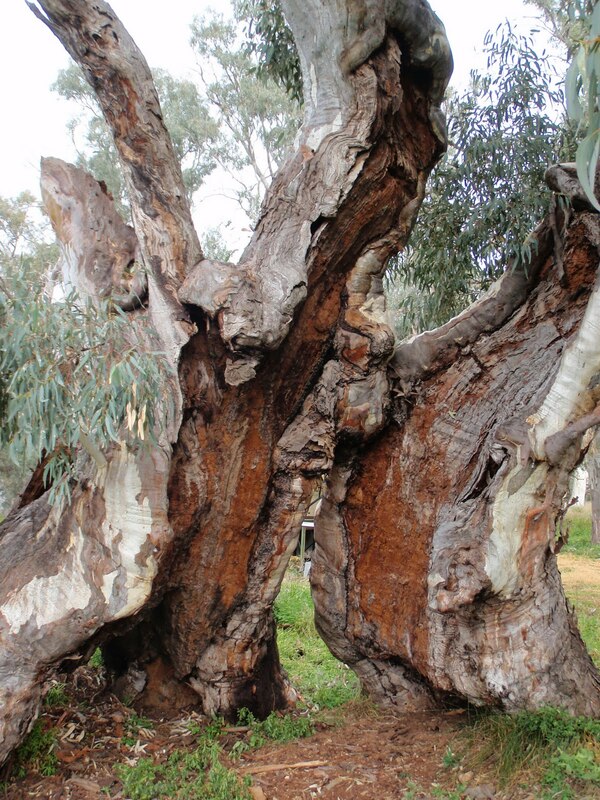 Stepping out of the camper, the first thing to feast the eyes upon was an ancient tree. Judging by the size of the trunk, at least 300 or more years old and the energy of its presence was just what I was looking for. On the other side of the camping area that we had set up in, another tall tree with a hive of bees in it. A quiet morning and we stayed around the campfire and re-started it to bake some scones in the camp oven whilst the others played with their campers and braking. Oven hot, mix made (from a packet) and scones cooked in no time at all – only to find that the flour or the shortening in the mix had gone rancid and whilst they looked yummy, the scones tasted dreadful! They were quickly returned as fuel for the fire – looking almost like those heat beads as the fire consumed them with gusto. The evening dinner was cooked up at the restaurant and we returned to the fire for more socializing and stories. Sunday saw a trip in convoy around the property. A feature of which was a long stretch of hand made stone wall, which had been constructed in the 19th Century by Scottish labourers at the cost of one pound per chain. They also brought another reminder of their homeland – the thistle. With the number of vehicles in the group and the steepness of the terrain in places, progress was slow but steady and we returned to the campsite sometime after 2pm, whereupon most packed up their campers and left for various destinations. We took another road less travelled and headed east out through Pinnaroo and beyond, stopping overnight at Murrayville which is not on the Murray River at all. More driving the following day through canola fields – some with large holes in the swathe of flowers – due to the recent mouse plagues, where the rodents had eaten the seed after sowing. On return to Melbourne, the power problem with the Nissan had not improved at all. This ruled out any fuel problem as we had completely re-fueled by this stage. Bit awkward when fully laden semi trailers can pass you on the climb up the hills outside Bendigo. Duly booked in for a checkup, the problem was found – a broken wire to the turbo. Guess this vehicle is going to be remembered for which wires broke on which trip. (Broken wire in the firewall to the MAF on the way back from Broken Hill) & lost count of the times the tail light wires have broken on various desert trips! Interesting parallel to think about broken electrics, given my own health issue!